Although everyone knows that good sexual relations are a foundation of a successful marriage, many couples neglect the way their bedrooms look. Many of them make it appear like a mini-store room. 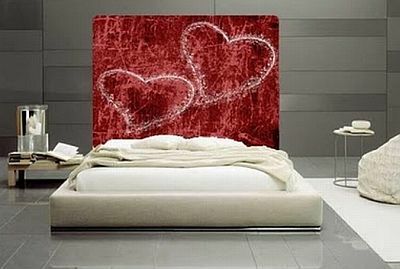 There are few things to be maintained and few to be avoided in the bedroom to maintain the romantic vibrations. Also this place is meant for 7 to 8 hours of sound sleep, so that a person remains active throughout the whole day. Bed should never be in the middle of the room. It should always have a strong wall support at one end (where heads rest) and this strengthens the relations between couple. Always prefer a wooden bed or a cot over a metal one. Metals like steel, iron, aluminium lead to ego clashes among couples and ultimately may end up in divorce. Never place a mirror in bedroom in such a way that your sleeping reflection is seen in it. If you still want to have a mirror in bedroom, make sure that reflection of bed is not seen in it from any angle or it is covered while sleeping. Avoid dressing tables etc too in bedrooms. Avoid pictures or photo frames of your ancestors, deceased people, gods, goddesses etc on bedroom walls. They take away the romantic vibrations. Instead have a pleasant painting of nature, waterfall etc or a romantic couple. Bedroom should have bright colors like Red, orange, pink,etc to enhance the mood. Lighting should be 2-way. Use dim lighting in romantic moments and during other moments have bright lighting. If you have no option other than to have photo frames on walls or unnecessary furniture or storage material, then atleast try to have a partition between them and your bed. Sleeping with head towards South increases sexual satisfaction and induces deep sleep. Sleeping with head towards West is also good for sexual relations and sleep. Sleeping with head towards East causes irritation among partners. Sleeping with head towards North should always be avoided. Never use black, or dark blue curtains in bedroom as they will lead to ego clashes among couples. Always use pink, lavender and similar romantic colors. Note : Most important is to understand that Bedroom is different than store room.